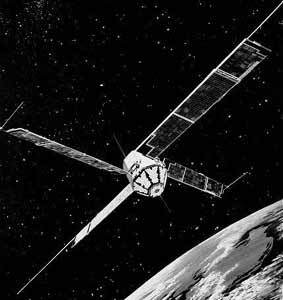 The BE (Beacon Explorer) satellites provided Laser reflectors for geodetic measurements as well measured the electron density in the ionosphere. The main purpose of this satellite is to record observations of electron content between the earth and the satellite worldwide. Other duties include using a three-axis magnetometer and sun sensors to determine satellite spin rate and attitude data. Information could only be connected when the satellite was in range of a ground telemetry station, because it did not have a tape recorder. Initially, the Beacon-C was spin stabilized; however, after the solar paddles were erected, the satellite was despun. A strong bar magnet and damping rods were used to align the satellite axis of symmetry with the local magnetic field. Transmitters operated at 162 and 324 MHz and were turned off on 20 July 1973 because these frequencies interfered with more important spacecraft. SLR (Space Laser Reflector) data from Beacon-C is used to monitor the secular and long period tidal variations in the Earth's gravity field. SLR provides a critical global constraint on the geophysical modeling to improve our understanding of the rheology of Earth, such as the mantle viscosity and anelasticity, and the postglacial rebound since the last ice age. Passive Laser Tracking Reflector consisting of 160 cube corners.